Affordable barcode designer helps to create bulk of barcode list with extensive support to all industry standard barcode font symbologies. Powerful barcode labeling tool helps to improve efficiency and performance of business by generating high resolution 2D and linear barcode labels. 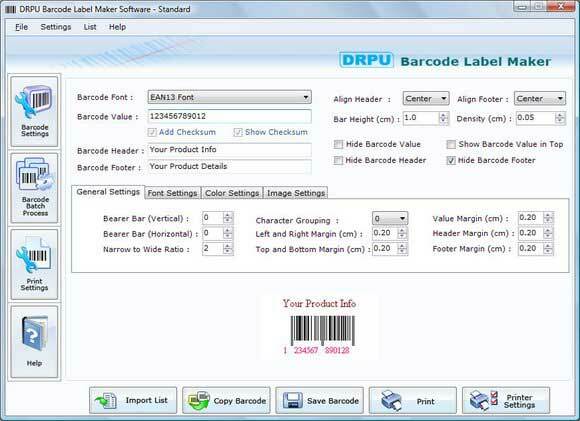 Automatic barcode maker tool facilitates user to produce high resolution bulk of customized barcodes with modification in their font, color and dimensions. Advance barcode label maker software able to generate bulk of high quality barcodes, stickers and tags simultaneously in very few mouse clicks. Barcode generator works on Windows platform and supports all major Windows Operating systems including Windows ME, Windows NT, Windows 2000, Windows 2003 Server, Windows XP and VISTA. Barcode development software has powerful features which creates and prints good quality barcode labels in less time and cost which makes it money-making and business efficient tool for commercial purposes. Barcode creator has friendly GUI interface and simple functionality that allows user to easily understand its working and program. Barcode making tools gives you high resolution barcode images for all commercial sectors like inventory, shipping, billing and mailing. Professional barcode generator produces high amount of printable barcodes which is ready-to-print and saves them in major file format including jpeg, tiff, png, gif etc. Software features: * Barcode generator program makes you able to use various designing object to improve your barcode quality and looks. * Advance barcode maker is designed to print huge amount of colorful barcodes simultaneously in very little time. * Barcode creator compatible with all major file formats and use these formats to save barcode images. * Affordable barcode developer is fully automatic and most convenient tool for barcode, stickers and tags production.